My edition: Paperback, published on 15 March 2015 by Alma Books, 288 pages. Description: When twenty-year-old Jonathan Maguire wakes up in a pool of blood and with a dead body beside him, his shock and grief quickly turn to panic. Being arrested for murder will prevent him from fulfilling the promise he made to his parents - that after their death he would take care of Roger, his mentally handicapped older brother. Roger lives in a strange and complex world of his own creation - populated by millions of tiny insects - his insect farm. As the police move in, it emerges that Roger may know far more than he has revealed, and the action hurtles towards a stunning conclusion. After the first Curtis Brown Book Group novel, the hugely compelling The Ship by Antonia Honeywell, was such a spot on pick for my personal reading preferences, I admit I felt a tad disappointed when The Insect Farm arrived in the post for the second discussion. The cover and blurb made it seem like a gruesome crime novel, which is one of my least favourite genres and so I feared that I would struggle reading this novel. Thankfully looks were deceiving and what was hidden within was an incredibly fascinating read, and one I found myself quickly pulled into. The story centres on Jonathan and Roger, two brothers who live their lives through an obsession – each in their own way. To the outside world Jonathan is the more together one of the two; he goes to university, falls in love and his life goes through the same motions as that of most other people around him. Roger, however, doesn't emotionally progress as fast as he does physically and his stunted social skills means that he needs taking care off, even after he has reached adulthood. While Jonathan enjoys uni life and his girlfriend Harriet, Roger becomes more and more obsessed with his insect farm, which he has grown from the handful of species he had as a child, to a full-on enclosure in the garden shed. The two brothers spend less and less time together, each absorbed in their own world, until a catastrophe forces them together once more. They soon find a rhythm in their new lives and they become closer than ever, but there's an eery feeling lingering at the edges of the pages that something just isn't quite right. As I mentioned at the top of my review, my expectations for this were very different from the reality and so this book really took me by surprise – in a good way. The story of the two brothers was a fascinating one, and while solely seen from Jonathan's perspective (save the sinister prologue), I felt I really got to know Roger as well as the years went by. I felt invested in their lives and the hardship they had to endure, even though there was a sense of unease faintly lingering in the background through all the ups and downs that didn't became evident until much later, when everything finally made sense. 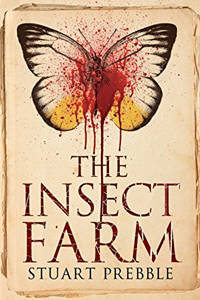 The Insect Farm was a suspenseful and exceptionally compelling novel – laced with many twists that I did not see coming, which was a real treat as so often nowadays I find 'twists' in books predictable and redundant – and one that really grabs the reader in its clutches. Even weeks after finishing it, I am still thinking about Jonathan, Roger and how they got to that ending. The pace of the story really escalated towards its intriguing conclusion, which put everything I'd read in an entirely new perspective and made me want to revisit earlier scenes to see them from a different angle. And a novel which makes me want to read it again, even when my to-read pile is already toppling over, is definitely a good one. Many thanks to the Curtis Brown Book Group for an advance copy of the novel in exchange for an honest review.